Previous post match analysis starting from the preliminary study. Preliminary statistical analysis of Euro 2016: Portugal-France had shown that both teams had an average pulls to the opponent’s similar (16) most of them the result of conclusions from the central area (65%-70%) with most originating in the area (50%-58%), and others from the edge (47%-41%) with only a small percentage near the opponent’s goal (3%-2%). This aspect implies a race played much on the technical features and the high rate of certain items as risky for players who would occupy the central area defensively in that would have been the most stressed. To confirm what argued before this final, there is a network of European Championship victory that Eder 2016 for Portugal. 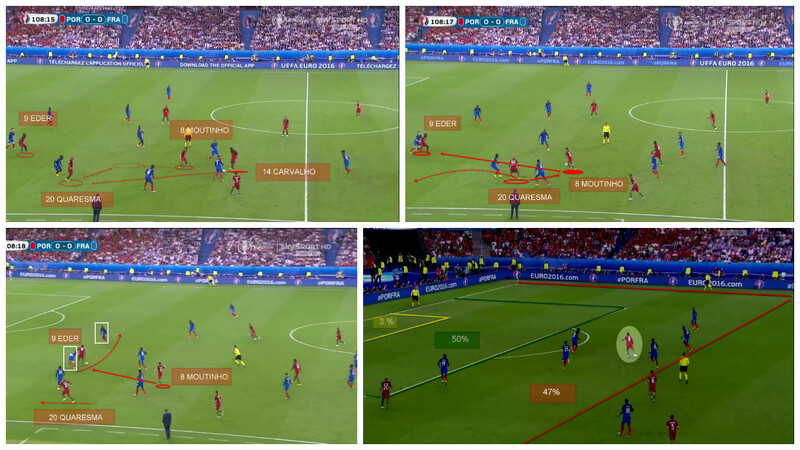 Portuguese offensive action originates from a recovery ball near the second third of the field followed by an initial development of Moutinho in the outside lane sx (which is preferred by the Portuguese in 37% of cases) on Quaresma, proposed between the opposing lines. These, received the ball, combined with partner to support putting him in a position to serve Eder near the French defensive line. The Portuguese centre-forward, using his considerable physicality, can easily get rid of the marker in the middle of the field with direct before finalizing with a shot from the middle distance.